Series EK3 kits make job task analysis and ergonomics analysis simple and accurate, ideal for workplace design, physical therapy, and ergonomic studies. 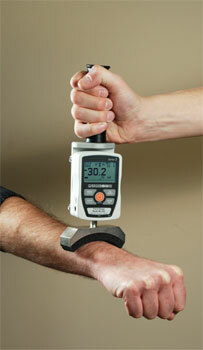 These kits present the ergonomist and other professionals with a simple and economical testing solution. 200 lbF and 500 lbF capacity force gauges are available. MESURTM Lite software - MESURTM Lite tabulates individual data points from Series 3 gauges. One-click export to Excel easily allows for further data manipulation. Clevis Grip - Spring-loaded pin with ball plunger locks into place for added safety in pull tests. Flat Attachment - Round attachment for compression tests. Accessories - Cushioned carrying case, AC adapter, battery, users manual, and NIST-traceable certificate of calibration.